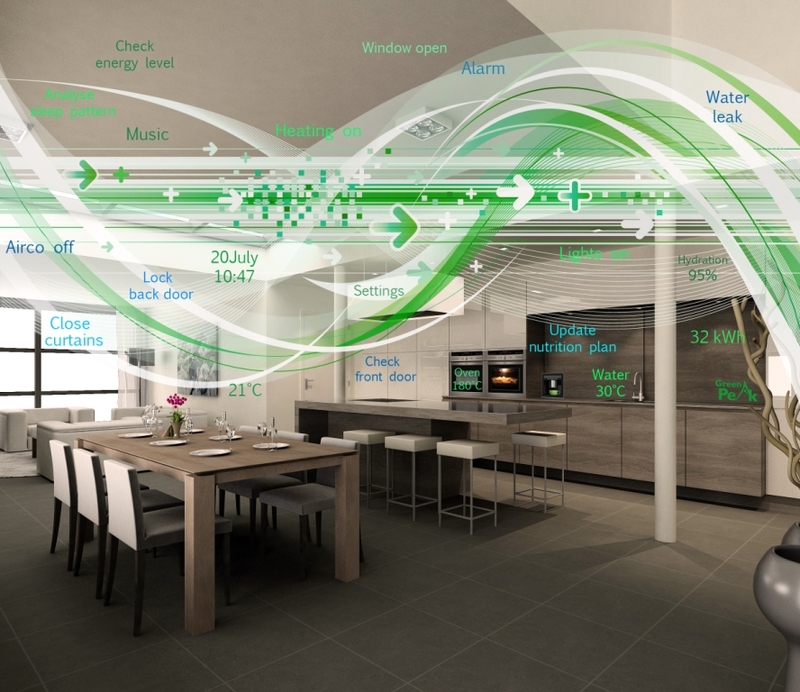 Imagine a houseful of sensors of various types – monitoring temperature, motion, presence, leaks, noise, etc., all talking to a central home gateway that has both a local remote control or dashboard as well as a cloud connection that in turn can be accessed by a smart phone or smart device form anywhere in the world. This will enable to the homeowners to manage and control a diverse spectrum of home conditions either from within the home or from anywhere they can get an internet connection. Even more exciting, the smart home of the future will be really and truly smart – able to recognize individual members of the household and then adopt the home to their preferences. In the really smart home of the future, not only will there be a multitude of various sensors throughout the house, there will be cloud based intelligence at play that will enable a single sensor to provide various roles within the smart home. For example, a motion sensor in an empty house can function as part of security solution. The same sensor could function as an earthquake warning, triggering shut downs of gas and water utilities. The motion sensor could also function as human movement status alert, monitoring the movement of people within the home to make sure they are healthy and mobile. In yet another way, it can be used to recognize individual members of the family and then customize the home’s response for lighting, entertainment and environmental conditions to match the preferences of that specific person. However, the Smart Home is still a work in progress. The smart home will evolve in three major phases as various device and system manufacturers, service providers and consumers recognize the benefits and understand how these systems will all work together. The first phase has been in progress for the last three years or so. Almost every new set top box or gateway device already has ZigBee built into to it to connect to the device’s new wireless RF remote control. This means that many households already have a ZigBee network, but the residents are not aware of it. To provide extra features and reduce customer service calls, cable TV and set top box makers have been converting remote controls to RF for some time. A new generation remote control technology has recently been launched. Known as ZigBee Remote Control 2.0 (ZRC 2.0), this new networking control enables remotes to not only control the entertainment system as expected, but to control many of the other appliances and automated systems within the home. Plus they include what is known as Find My Remote. Press a button on your TV or appliance, and your missing remote will start buzzing or flashing. The second phases has already started as many of the world’s leading cable MSOs, broadband service providers and telcos have finally recognized the potential of the home services market and are starting to market and roll out a wide variety of new home automation and connected home services. These include family lifestyle and home health monitoring, temperature monitoring and control, home security, energy management, remote locking and unlocking of doors and windows, turning lights off and on, water and gas leak monitoring, etc. The underlying technologies and solutions have been around for a while but were limited to use by “early innovators” and techie DIYers who would spend the time and effort to figure out how to make these disparate elements all work together. However, with the emergence of new standardized wireless communication technologies for low power, low data rate networking, there is finally a path of major industry players to make money. Numerous major home entertainment and internet service providers, as well as edge device manufacturers, have agreed upon the ZigBee communication standard as the path forward that will enable the smart house to take a giant step to becoming reality. The next step is adding intelligence to reduce the need for a human being to be in the loop between sensing devices and the actual devices and appliances. Currently most smart home networks are essentially part of the Internet of People. To become truly the Internet of Everything, there needs to be intelligence at play that decodes the incoming information from the network of sensors and them directs the various devices to action. Advanced intelligence - whether living in the cloud or locally in the home control box or set top box, will be able to assess the incoming data against a set of rules and then provide the appropriate response. For example, a home’s motion sensor provides data whether somebody or something is moving nearby. In the middle of the day, when no one is supposed to be in the home, the motion alert will register as a possible security incident. However, in the evening, when the family is home, the same motion sensor will recognize the presence of a family member, and instead, will turn on or off the lights or activate the heating or air conditioning, depending on the time of the day, the location of the alert, the calendar season, as well as the temperature inside and outside the home. CAPTION: The Smart Home of the Future will utilize a variety of sentrollers connected via ZigBee to cloud intelligence that will be able to customize the home environment to its residents – changing and evolving with them as they go through their daily rituals. Recently, GreenPeak announced a new Family Lifestyle System, a monitoring solution that incorporates a handful of motion and position sensors located on various doors in the home as well as on the home appliances. Over a period of a couple of weeks, the sensors are able to “learn” the typical schedule of activities in the home, and then, if there is a change in the pattern, will send out an alert. For example, if Aunt Jane usually wakes at 6:00 am, visits the bathroom at 6:30, goes outside to get the newspaper at 7am, and makes coffee and toast at 7:15am, etc., The Lifestyle Monitoring networking can send an alert to her family or caregiver if none of these activities occur per her normal daily schedule. The real interesting aspect is that this happens without her having to carry any device, or needing any cameras installed in the home. She can just be “herself”, being assured that if something would happen to her, that this would not go unnoticed. The intelligent network can also learn individual family activities and preferences. If the woman of the house comes home at 7pm, the sensors can recognize her car parking in the driveway, and then automatically activate the Electric Car Power recharging systems, unlock the front door, mange the lighting, turn on the air conditioning or heating as needed, and even activate the entertainment system to play her favorite music. This is the third phase of the smart home, when the house is smart enough to recognize who is in the house and to correctly adjust and customize the home experience for their optimum comfort. This third phase is in the preliminary state now. As the home sensor networks begin to roll out, with more and more sensors are installed throughout the home, and the intelligence is developed and delivered, one day, maybe 20 years from now, we will wonder how we managed to live in a dumb home that doesn’t know how to behave.